Spanish singer and songwriter Rosalía Vila Tobella, more popularly known as Rosalía, has announced that she will be touring US and Canada from 17 April 2019 to 2 May 2019. Rosalía will be beginning the first string of her solo US tour dates in Los Angeles on 17 April 2019 at The Mayan. Following this she will travel to San Francisco on 22 April 2019 and New York on 30 April 2019 at Webster Hall. She caps off the North American leg of her El Mal Querer tour in Toronto, Ontario, on 2 May 2019 at Rebel. Following her North American tour dates, Rosalía is set to perform multiple shows across Europe. She will be performing in her home country Spain, as well as France, Portugal, Belgium and Netherlands. The tour comes to an official close in Switzerland on 18 July 2019. She has set out on her El Mal Querer tour in support of her latest album of the same name. El Mal Querer, Rosalía’s second album, was released on 2 November 2018. It showcases her Spanish roots with a mixture of flamenco, R&B and pop music, with her clear and powerful voice at center stage. She is known for hits like Malamente (Cap. 1: Augurio), De Aquí No Sales (Cap.4: Disputa) and her feature on English musician James Blake’s song Barefoot In The Park. 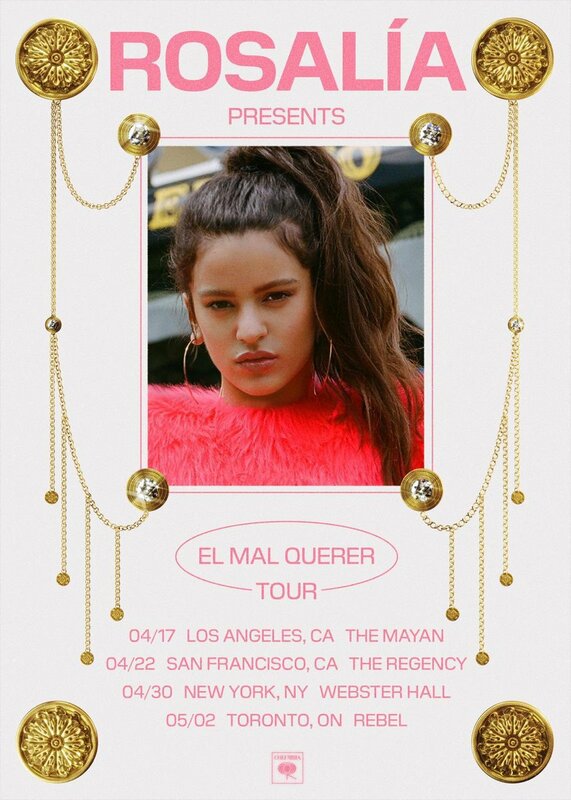 Tickets for the El Mal Querer tour are available for purchase on the official Rosalía’s website.